Do patients at risk of infective endocarditis need antibiotics before dental procedures? Click here for a patient information leaflet on infective endocarditis, summarising common symptoms. We are grateful for Buchan and colleagues’ positive comments. We agree that the lack of microbiology information associated with an infective endocarditis diagnosis is a significant weakness of the ICD-10-CM coding system used for the NHS Hospital Episode Statistics (HES) Admitted Patient Care episodes. We are hopeful that ongoing prospective registry studies in the UK and Europe will provide insights into the microbiological aetiology of excess cases, but these cohorts may not have such broad coverage as HES. Buchan et al request details of the two deceased patients whose spouses gave input to our article, a commendable requirement from the BMJ for this series. In these two cases, one had a prosthetic valve and one a bicuspid valve. Both had received antibiotic prophylaxis before invasive dental procedures prior to the 2008 NICE guideline change, but were advised by their dentists that it was no longer needed following the change. It is notable, however, that only one would be considered high-risk under current ESC guidelines. 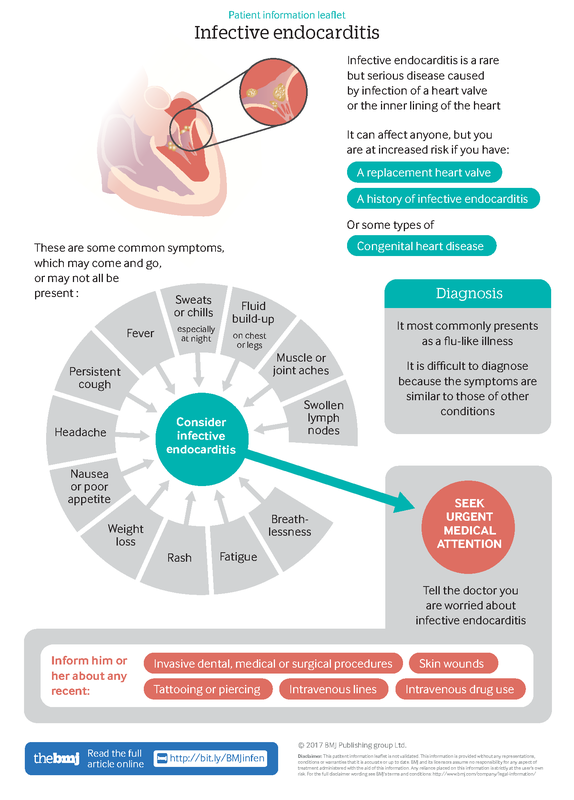 Alongside clarifying the role of antibiotic prophylaxis, both relatives emphasised that more must be done to educate those at moderate- and high-risk of endocarditis, as well as clinicians (especially GPs and dentists), about the symptoms of infective endocarditis in order to reduce delays in diagnosis and improve outcomes (see Infographic at http://www.bmj.com/content/358/bmj.j3942). Parrish suggests that dental infection could be a confounder for dental procedures. A challenge for future studies will be to gain insights into patient-level risk factors such as oral hygiene status, while being adequately sized for statistical power. Parrish also estimates that the number needed to prevent (NNP) a case of infective endocarditis may be as high as 2000. Estimates of the NNP for antibiotic prophylaxis are highly variable, and in comparison, UK data (based on excess cases since antibiotic prophylaxis was withdrawn) suggests a NNP of 277 (95% CI 156-1217).1 In the context of the current uncertainty, we would reiterate our approach: to educate all at-risk patients about infective endocarditis, to outline the evidence available, and to offer antibiotic prophylaxis to those in high-risk groups. Baker and Alderson emphasise elements of the available data to support the decision made by NICE to withdraw antibiotic prophylaxis for patients at risk of infective endocarditis in the UK. Differing interpretations of best practice in the context of limited data are the essence of the ‘uncertainty’ which underlies the BMJ’s series and are to be welcomed. As outlined explicitly in our Uncertainties article,(1) Baker and Alderson reiterate that dental procedures account for a minority of cases, that the absolute risk of infective endocarditis after a given procedure is low, and that there are potential risks associated with antibiotic prophylaxis (although contemporary UK data suggest that there has never been a death associated with amoxicillin antibiotic prophylaxis). (2) We acknowledge these caveats. However, given the evidence of possible benefit and very low risk of harm, we believe that decisions concerning the use of antibiotic prophylaxis should be devolved to individual patients and not taken at national level. This approach, that is supported by European and American guidelines, allows those at highest risk to make decisions regarding their care with support from general practitioners, cardiologists and dentists. We are in complete agreement that the rising incidence of infective endocarditis observed in multiple countries is a cause for concern, and that research funding is required to understand this. Furthermore, research needs to not only clarify the role of antibiotic prophylaxis for invasive dentistry, but also investigate other novel preventative strategies. 1. Cahill TJ, Dayer M, Prendergast B, Thornhill M. Do patients at risk of infective endocarditis need antibiotics before dental procedures? BMJ 2017;358. 2. Thornhill MH, Dayer MJ, Prendergast B, Baddour LM, Jones S, Lockhart PB. Incidence and nature of adverse reactions to antibiotics used as endocarditis prophylaxis. Journal of Antimicrobial Chemotherapy 2015;70:2382-8. Re: Do patients at risk of infective endocarditis need antibiotics before dental procedures? We read with great interest the review article by Cahill et al (1) on the need for antibiotic prophylaxis prior to dental procedures in patients at risk of oral streptococcal endocarditis. The previous recommendation from NICE to abandon antibiotic prophylaxis (2) has been met with alarm in the cardiac surgical community (3). Cahill et al point out the increase in incidence of endocarditis in the UK since the introduction of the NICE guidelines but also highlight the lack of confirmatory evidence that the increase was due to the occurrence of more streptococcal endocarditis cases. It is lamentable that the official records do not permit subanalysis of the infecting organism, a situation which should be addressed urgently. One of us (KB) has personally had three patients over a period of 10 years (since the NICE guidelines came into effect) who had conventional risk factors for endocarditis, who were not given antibiotic prophylaxis for invasive dental surgery and who subsequently developed dental streptococcal endocarditis. It is right that Cahill et al acknowledged the great loss experienced by two families whose relatives died as a direct result of infective endocarditis following dental procedures. They do not mention whether these patients were known to be at high risk for endocarditis or not and we request that, where possible, they clarify this matter. Clearly nothing can be done to prevent dental-acquired endocarditis in patients without risk factors for it. We commend the BMJ for publishing this article which considers a move back to permitting antibiotic prophylaxis for patients with prosthetic heart valves. This is something that cardiac surgeons have always considered to be mandatory. 3. Dayer M J, Chambers J B, Prendergast B, Sandoe J A, Thornhill M H. NICE guidance on antibiotic prophylaxis to prevent infective endocarditis: a survey of clinicians attitudes. QJM 2013; 106: 237-243. Cahill and colleagues here repeat their endorsement of a policy which advocates routinely offering antibiotic prophylaxis to people at ‘high’ risk of infective endocarditis when they undergo invasive dental procedures. The authors quote their own work in supporting their view that antibiotic prophylaxis in these patients is very effective, but do not acknowledge that their findings were challenged during the development of the current NICE guideline. (https://www.nice.org.uk/guidance/cg64/evidence/full-guideline-addendum-p...). They do, however, note that “high risk” patients should be reassured that they have an “extremely low” risk of infective endocarditis after dental procedures – even without antibiotic prophylaxis. They also point out that the evidence shows invasive dental procedures are in any case not the main trigger for the majority of cases of infective endocarditis. In fact, the large majority of cases of infective endocarditis in the study by Tubiana and colleagues were not associated with any dental procedure at all (Tubiana S, Blotière P, Hoen B, et al. Dental procedures, antibiotic prophylaxis and endocarditis among individuals with prosthetic heart valves: a nationwide population-based cohort and a case-crossover study. BMJ2017 doi:10.1136/bmj.j3776). Cahill and colleagues also highlight that there is a lack of studies showing whether a reduction in the incidence of bacteraemia as a result of antibiotic prophylaxis translates into a reduction in the incidence of infective endocarditis. Indeed, because the risk of infective endocarditis is extremely low, the number needed to treat would be very high – we estimate it to be several thousand to prevent 1 case of infective endocarditis. If their advice is followed thousands of patients will be given antibiotics with no chance of benefiting but with the attendant risks of anaphylaxis and increasing antimicrobial resistance. What is beyond doubt is the worrying and poorly understood long term trend of an increasing incidence of infective endocarditis around the world despite various antibiotic prophylaxis policies. The NICE guideline recommends that the research community needs to design better epidemiological research to understand the causes of this phenomenon and to suggest better preventive strategies - focusing solely on exposure to invasive dental procedures risks distracting that research effort. Competing interests: Professor Mark Baker and Dr Philip Alderson are employees of the National Institute for Health and Care Excellence (NICE), in which capacity they have been directly involved in the development and subsequent review of NICE's clinical guideline on prophylaxis for infective endocarditis. It is interesting to see the same arguments for prophylaxis being re-hashed once again in the face of further lack of evidence of efficacy. In the developing world where a replaced valve is even more valuable because of higher re-do hurdles, the case for a cheap effective intervention is even more persuasive. A pity we have no new evidence of efficacy. Even assuming 50% efficacy and the French streptococcal endocarditis incidence rate, this gives a NNT of around 2000 to prevent one episode. An interesting confounder which is not often talked about is the possibility of increased bacteraemia in the days leading up to some dental procedures. Patients with a dental abscess might repeatedly wriggle the offending tooth, and it would be fascinating if cohort studies were adequately powered to look at the endocarditis rate by length of pre-intervention symptoms and extent of suboptimal oral hygiene. You are going to email the following Do patients at risk of infective endocarditis need antibiotics before dental procedures?